Swordfish is often cooked on the grill or in the oven, but the simplest way to cook a delicious, fresh swordfish steak is in the microwave. This large fish is high in vitamins B6, B12, D, as well as omega-3 fatty acids and protein, making it a highly nutritious meal. Microwaved in a tasty sauce, it's a relatively quick and easy one, too. Wash the fresh swordfish steak under cool running water for 30 seconds to remove any dirt on the surface. Add ginger, soy sauce, sherry and garlic in a bowl. Whisk to combine. Pour the whisked sauce into your microwave-safe baking dish. Put the swordfish steak in the dish, turning it over to fully coat it with the sauce. Place a piece of wax paper on top of the microwave-safe dish, then put the dish in the microwave. Cook on "High" power for 6 minutes. Flip the swordfish steak over, then continue cooking for an extra 3 minutes to finish your dish. 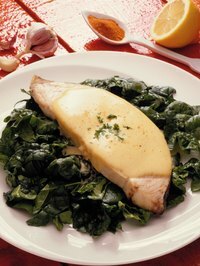 Add butter on top of your swordfish before cooking to add an extra-creamy texture to the top layer of the fish. Do not stand close to the microwave-safe dish when you flip the swordfish steak over. Turning the fish will release hot steam into the air, and failure to move away from the steam may result in severe burns.